So as many of you know, at least those of you who are faithful readers of this blog, our pool is still not complete as our pool guy took off with our money. We have been trying to save up enough money to complete the project since that time. In the meantime, there have been rain storms...lot of rain storms. Since we have a big hole in our backyard, the rain collects in the pool and just sits there. A few weekends ago Heather and Danny brought their dogs Aspen and Gracie over for a playdate with Hunter and Flash. 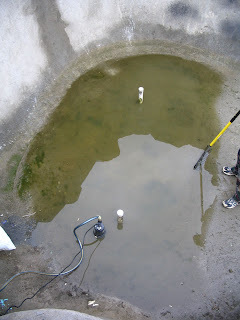 It was then that we noticed how TERRIBLE the pool had become since the recent rains. Since we happen to be lovers of frogs and such, Dave and I decided it was about time to clean it up. After all there was more rain in the forecast so it would just get worse. We went to Home Depot and bought a pump, chlorine and the like to start our detox of the pool. First. 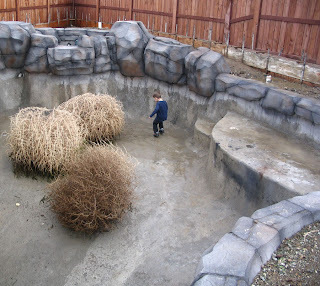 we (and when I mean we, I mean Dave) cleaned out the tumbleweeds from inside the pool. 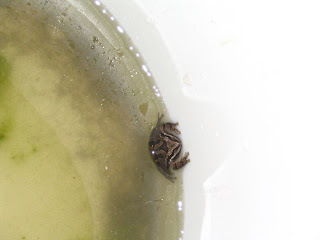 Next we rescued the frogs, and unfortunately Dave decided to rescue this HUGE spider. 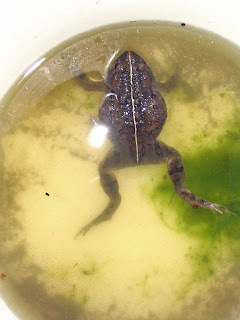 We decided that we would relocate the frogs to a nearby swamp area as we were going to dump loads of chlorine in the pool to kill the rest of the ecosystem that had sprung up. Caiden thought it was loads of fun. We collected the frogs and then drove them to the local swamp where we had just enough time to release them before the rain came pouring down on us. We figured they would have a better chance of survival there than in the chlorinated pool. Thankfully, the pool is back to normal now...well at least until the next rainstorm hits. 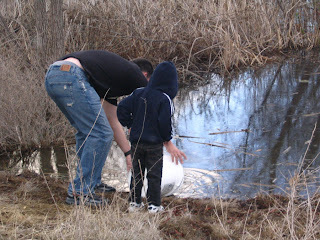 What a great lesson for Caiden! How fun is that to get to play in your own ecosystem. That was pretty cool. 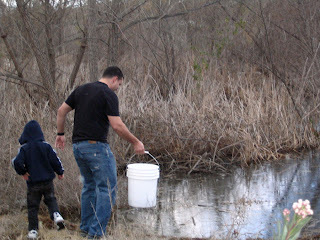 I love it that you saved the frogs. I also love that you saved the frogs. I do hope you guys are able to get your pool done by the summer.